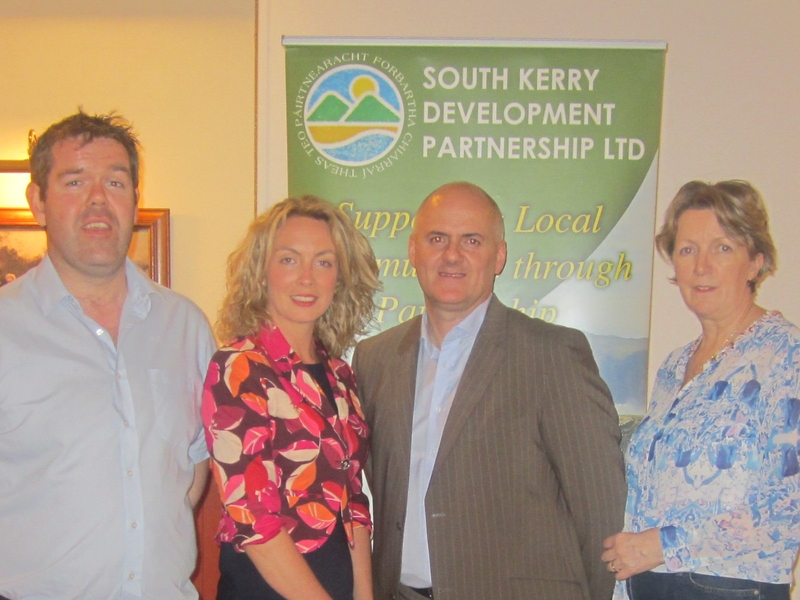 June 2014 – South Kerry Development Partnership CLG. More than 40 start up business owners from the greater Killorglin area gathered in The Manor Inn on Thursday night last in a bid to develop new contacts and to offer support and advice to each other in overcoming issues they are encountering. Organised through the Back to Work Enterprise Allowance scheme, operated through South Kerry Development Partnership Ltd. the event was addressed by Wayne Murphy of the Accelator Programme as well as Michael Kenneally of the Department of Social Protection and Paul Murphy of the South Kerry Skillnet. The business owners were also provided with the chance to interact and learn about each other so as to open up possible links where they could work together in the future. Addressing those present, Wayne Murphy praised the Back to Work Enterprise Allowance initiative in allowing people to work while receiving support from the state while building up their businesses. He also stressed the importance of developing a business plan, not just as a tool for accessing finance initially but as a tool to help ensure the business achieves its goals and maintains its focus. The business plan is something that should be reviewed and updated regularly he said as it is the vision, the path to success and the foundation and structure for the business. He also outlined details of the Accelator Programme and encouraged the businesses present to see if it was something that they could get involved with. Killorglin area BTWEA Officer with SKDP Joanne Griffin said she was delighted with the turnout and the interest the businesses showed in taking advantage of the opportunity to network with and learn from each other. “Many start up businesses experience similar problems and this has given those business owners the chance to learn how others solved them and to realise they are not alone when encountering such issues” Joanne added. The importance of operating a tractor safely in a farm setting was emphasised to senior students of the Killorglin Community College this week through a practical, hands-on course at the school. The course, organised by South Kerry Development Partnership’s Rural Agricultural Office John McCrohan and funded through the Family Supported Learning Budget of SKDP, was aimed at ensuring that Ag Science students at the college got the opportunity to see at first hand the potential dangers around operating a tractor and how to minimise the risk to both themselves and others when working on the farm with the tractor. 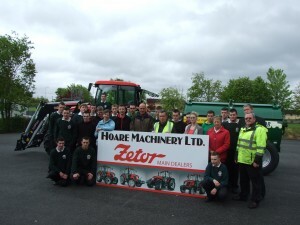 The course was arranged following an approach from Killorglin Community College Principle Con Moynihan to SKDP and the Zetor Tractor and other farm machinery for the safety course was provided free of charge by newly appointed Zetor main dealer for Kerry, Hoare’s farm machinery in Killorglin. SKDP’s John McCrohan said that he was delighted to get involved in organising such a course for the students given how vital it is to ensure that safety on farms is the number one priority. “We have seen over the last number of months’ accidents on farms involving tractors and machinery resulting in serious injury and unfortunately the deaths of farmers so helping stress to these students the importance of working safely with the tractor in particular is very important” John said. Tim Hoare of Hoare Farm Machinery said that while manufacturers such a Zetor were always aiming to improve the safety of their products through innovation, it is still vital that farmers have the knowledge on how to handle and use these machines safely. The tractor is a key piece of equipment on the farm and one where a farmer spends most of their time working with so the safe operation of it is crucial in order to prevent serious injury and even death”. “We are delighted to provide the tractor and other machinery free for this course as we feel it is an ideal chance to give proper instruction to these young farmers on the safe operation of such a tractor” Tim said. Ag Science teacher Marieke O’Connor pointed out that a farm is a dangerous work place, not just for the farmer but for other members of the farm family and by teaching the students the importance of safety and how to use a machine such as a tractor properly, we can hopefully reduce the danger of accidents on farms in the future. 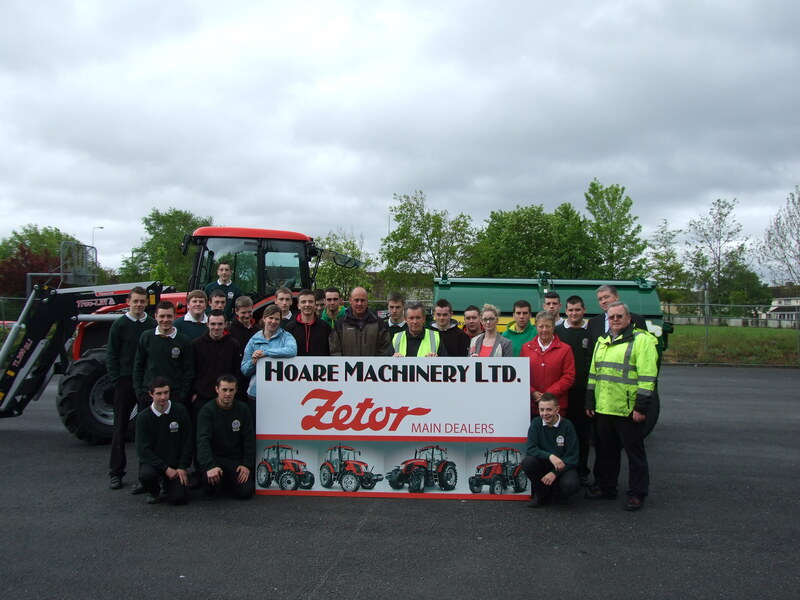 “I would like to thank both SKDP and Hoare Farm Machinery for enabling us to put on this course for our students here in Killorglin and I believe it is vital that students get exposed to a practical demonstration such as this one on tractor safety” she added. The course was conducted by trainer Val O’Connor of the FRS training group and involved some 20 senior students at Killorglin Community College. “The Dawn” Film Workshops has succeeded in achieving another first for Ireland with the arrival of world renowned cinematographer Daniel Pearl in Kerry to conduct a 5 day workshop. Among the many credits on Daniel Pearl’s CV are working on videos of all the major international music acts including U2, The Rolling Stones, Michael Jackson & Bruce Springsteen. His film credits include The Texas Chainsaw Massacre and Friday 13th. Supported by the INTERREG Rural Alliances Project through SKDP, The Kerry Education & Training Board, IT Tralee and the Dingle International Film Festival, The Dawn Film Workshops aim to bring top class film related training workshops to Kerry for film professionals and students alike. It is also aiming to help re-establish the region once again as a premier film location for national and international film companies thus providing a much needed economic boost, particularly off peak season. Brian Nolan of the Kerry ETB pointed out that the National Digital Skills Centre, based in the ETB Kerry training centre is to the forefront in terms of pushing out the boundaries of the film industry in Ireland and to have Daniel Pearl over to work in the centre and to pass on his tricks in cinematography is a unique opportunity. “The centre is the first to work with RED Camera equipment in Ireland and Daniel will be using the brand new ultra high definition 6k camera for the first time during the course courtesy of RED Europe” Brian pointed out. RED’s European Ambassador Sandeep Reddy is also providing technical assistance for the workshop. There are 14 participants on this course from all over Ireland, the UK and one who has returned from Dubai in order to attend. The workshop is also providing a welcome benefit for Kerry singer Tanya O’Sullivan as the group are shooting the music video for her song “Freak” as part of their practical hands on training. Part of this video is being shot on location at the Ballyroe Heights Hotel as well as in other locations in Kerry. SKDP’s Rural Alliances Project Manager Seán de Buitléar said that it is a major coup to have a person of the calibre of Daniel Pearl in Kerry for “The Dawn” Film Workshop series. “This will help establish the workshops in Kerry for the future and will hopefully lead to the development of a designated Film Workshop Festival in the county” he said. Maurice Galway of the Dingle International Film Festival said that he was delighted that Daniel could impart the many tricks he has learnt down through the years to the 14 workshop participants here in Kerry. “Kerry is very strong in terms of film professionals and festivals and having this workshop series is another major positive step for Kerry” Maurice said. Mary Lucy of the IT Tralee said that again, they are very happy to be able to support “The Dawn” Film Workshops in the county and they hope it will help provide many future job opportunities in the film industry in the county for their graduates.